I Swore I Would Not Get Caught Up In This. But. While Sylvia’s hull is being polished and primped, her interior is with Rod Souza in Petaluma. He is working his magic. The issue of interior color has come up. According to the build sheet made available from the maritime museum in Newport News, the correct color is Aqua Marine. OK so it’s settled…right…. oh no… noooooo. It’s never that easy if you get caught up in the details. 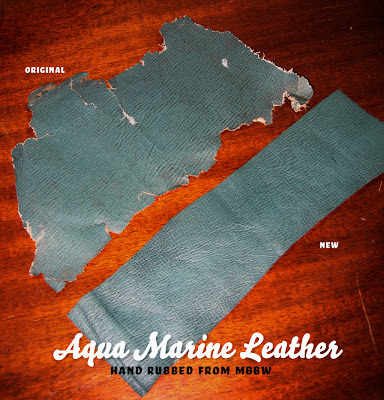 Macatawa Bay Boat Works has the best match to the orig leather. Hands down, dead on. There is no argument there. It’s the standard for this boat at most shows, and these guys are masters at this sort of stuff. They will even custom dye leather for you so you can be exact. But was is exact? Ya see. it’s leather. And the orig boat builders used different suppliers, and the dies were always different based on the batch. So the colors can vary. In my case. I was lucky enough to find some of the orig canvas tucked behind stuff in the innards of Sylvia. And its definitely aqua marine. It has a shade ..a tiny shade maybe 1% of more blue in it. It’s that subtle of a difference. That’s how close it is. But it’s only the canvas. Canvas and leather are two different animals. OK only one is an animal. The other a fiber. So what is exact. I swore that I would not let myself get caught up in this. But I have. Is 1% ok. I have samples from two different batches from MBBW. and they are 1% different. So I suppose we are OK. Please.. Give me permission to let go. I really wanted pig skin…..That’s the real issue.. I would have ordered it new, but since I wasn’t alive then, then I am just plain outa luck….. Now .. I also want orange seams on the boat. Oh god I really wanted a 1939. noooooooooooo.